Have you ever sat and just researched for inspiration online and were just annoyed with everything you found? It may be why I mostly avoid Pinterest these days. I struggle with the parts of my brain that want things to be cute and creatively put together, and the other parts that strive to complete every task with utilitarian flair (none, just get it done). Journaling has always been a necessary evil for me. It takes a lot of time to do, but I feel really great when I'm writing/drawing out thoughts and plans and stories. It's also a tremendous act of self-care, which is hard to commit to until the wee hours of the night/morning when you know everyone else is busy/sleeping/OK. Last year, I remember hearing of Bullet Journaling, and I was optimistic that it took all the many moving parts of our lives and compartmentalized them into daily/weekly/monthly checks and columns and rows and colors. It's called a "Bullet" Journal because you journal in bullet points, rather than long-form writing. In hindsight, my little paper Weight Watchers journal I carried for years was exactly that; just tailored specifically to lists and checks about food and activity. What I don't exactly love about Bullet Journals is that it's TOO cutesy for me; I think part of the charm is having to use a lot of creativity to get it inked out and ready for your daily updates. I had flashbacks to playing WWF on N64 in high school and remembering how we would spend HOURS creating our characters before the game part even started. And I rarely wanted to actually play the game at that point. Ultimately, though, with any new habit undertaking, we want to ask what the problem is we're trying to solve. All the fancy flowers and rows and color-coding won't really do anything if you don't know why you're doing it. At present, I have a pretty good system in place already for tracking calendar items and to-do lists, but I'm really lacking the motivation to just talk to myself about how I'm FEELING about everything I'm doing. I try diets for dieting's sake, but I don't know why, I don't know my goal. I say I'll go the gym, but I have no idea what I'm trying to fix by doing that. Without a way to measure if things are actually working or not, it's easy to just spin our wheels and give up. Anyway, yesterday I started a blank journal that just broke out the main things I wanted to talk to myself about, and I added a few check-boxes so I could have some sense of resolution on a few important points, too. I got really tired of journaling specifics and calorie counts and scale numbers and measurements. Right now my goal is to..."feel better?" I don't know for sure yet. I'm hoping this map of what wellness things I should be watching will ultimately show me something about myself. On the back of each page, I left a whole page free for notes/doodles/tasks anything that came up during the day to deal with. All the pages are penciled in at the moment to give me the freedom to change things up as I go along. When the day is over, I commit the page to a cute marker color of my choosing and pen my summary of the day and how I'm feeling about my choices and activities for the day. I can already tell I'll need to add some home care items, too, because I know when my home is out of control, I am too. It's a start. 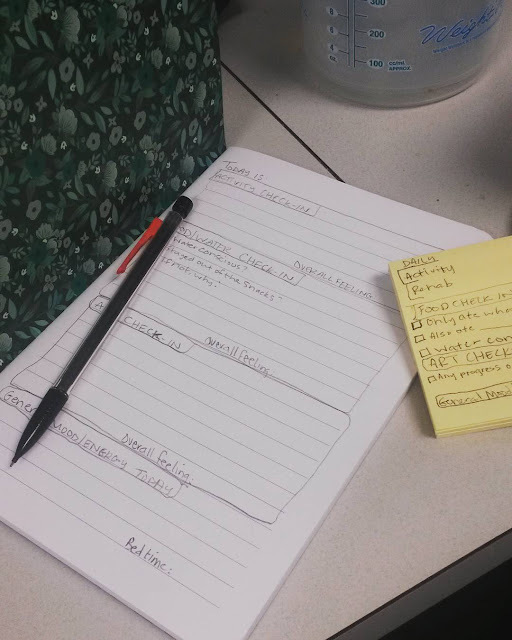 "Avoiding mindless snacking" is one of my big life goals at any given point in time, so just writing this blog post, and adding a new template page to my notebook are little things that are helping pass the time at least.